Kieser & Associates staff installed native plantings at one of the monitored “experimental” sites where there have been previous concerns with septic system drainfield discharges in 2018. The Midwest Glacial Lakes Partnership awarded the Eagle Lake Paw Paw Association (ELPPA) a grant in 2017 to test whether naturalized shorelines and deep-rooted shoreline vegetation can mitigate septic system contaminant and bacterial discharges to lakes. 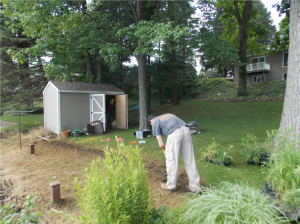 Over the past year, Kieser & Associates (K&A) has been working with the ELPPA to test seven ‘front yards’ around the lakeshore to determine how small patches of native plants grown between septic system drain fields and the water’s edge may protect water quality. K&A is monitoring shallow groundwater at three of these sites to determine how deep-rooted plants may help prevent nutrients and bacteria from reaching the lake. They are also monitoring how these small, but potentially important, plantings may help improve fish and aquatic habitat along the lakeshore. Test sites have been established to test groundwater both with and without native plantings. Differences in nutrient and bacteria concentrations will be used to determine whether there are real benefits with this innovative approach compared to much higher cost solutions of septic system replacement or sewering. This effort will help determine whether a simple patch of native landscaping along a residential shoreline can become an inexpensive way of mitigating this national problem of older systems contributing to water quality problems, impairing aquatic habitat and diminishing property values. Kieser & Associates staff installed groundwater monitoring wells in the native planting zone at an experimental site in 2018. Six groundwater monitoring wells were installed at each of the three groundwater monitoring test sites in April of 2018. These were placed upgradient, downgradient and cross-gradient of septic drain fields. Two rounds of semi-annual groundwater sampling have already been conducted. Samples were submitted for analysis of soluble reactive phosphorus, nitrate nitrogen, ammonia nitrogen, total dissolved solids, chloride, and E. coli bacteria. Nearshore macroinvertebrate sampling was conducted in May 2018 to serve as baseline conditions prior to natural shoreline installations. Samples were collected in front of each of the seven project sites, three of these also serving as groundwater monitoring sites. In July of 2018, a variety of deep-rooted native plants, co-selected with residents, were planted at four project sites, one of these with groundwater monitoring wells. The project is scheduled to be completed in 2019 although the ELPPA may continue to support longer-term monitoring to maximize benefits of the current efforts. These data will help determine whether this technique is viable, cost-effective, and scalable approach to address septic system discharges to lakes and streams. The MGLP will share the results of this project through future newsletters.